Steven King’s column has been suspended but management at the newspaper have still not been able to get in contact with their international affairs writer. 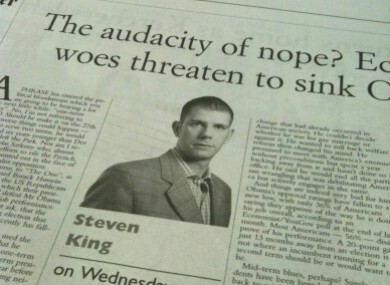 A Steven King column from Wednesday's Irish Examiner is among those alleged to include plagiarised content. THE IRISH EXAMINER has suspended one of its weekly columnists over serious allegations of plagiarism. Steven King, the newspaper’s regular international affairs writer, is accused of lifting lengthy passages for his columns from several sources, including British-based blog Spiked, website Salon.com and Commentary Magazine. The newspaper’s editor Tim Vaughan tweeted this morning that the column has now been suspended. However, in an unprecedented twist, management has not been able to contact the journalist since the claims against him were made on Wednesday. However, according to reports, King is simply not answering telephone calls from the Irish Examiner. Journalist Brian Whelan helped discover that King allegedly copied substantial amount of text and ideas from articles published by Spiked editor Brendan O’Neill. Another contributor to Spiked, Christopher White, also claimed that King “partly plagiarised” a piece he wrote last year. Whelan, who previously uncovered accusations against London Independent columnist Johann Hari, understands that the Irish Examiner is currently apologising to people whose work King allegedly plagiarised. Film director Mike Freedman also sent an email to the newspaper on September 27 after noticing similarities between one of King’s articles and a speech delivered by O’Neill to the Battle of Ideas seminar in London on October 30 last year. He published a blog post on the same date outlining details of both O’Neill’s speech and King’s column. It is unclear if the Irish Examiner’s investigation began after receiving Freedman’s email or when the story was published on Whelan’s blog. Email “Irish Examiner suspends columnist over alleged plagiarism”. Feedback on “Irish Examiner suspends columnist over alleged plagiarism”.